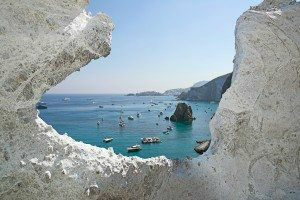 I was very excited to hear about the Pontine Islands, when I first did, years ago from an Italian sailing friend. Not long after I was able to cruise through the Pontine Islands on a 110′ Sangermani sailing yacht, and I was not disappointed. These islands, are only about 25-50 miles off of the west coast of Italy, near Rome and easily reached out of the harbor town of Gaeta. However they are still relatively unknown and unspoiled. There are no airports and limited ferry service, making this archipelago an ideal location for crewed yacht charter. 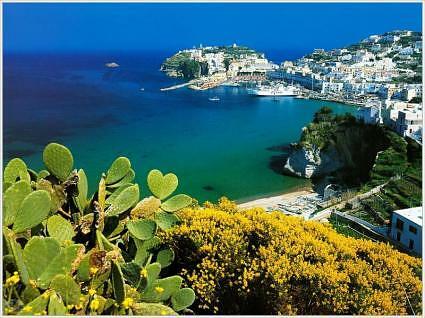 Ponza, rumored to have been named after Pontius Pilate, is the main island of the Pontine Island group, and is one of only two inhabited islands in the archipelago. Located in the Tyrrhenian Sea, the Pontine Islands are known for crystal clear waters in varying shades of blue, which surround these land masses created by ancient volcanic activity. 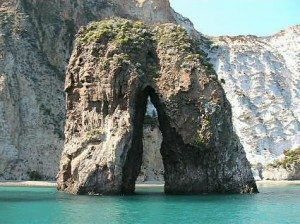 Ponza is the main island and in the middle of the Pontine Islands, and is believed to be the remains of the edge of a volcanic crater. 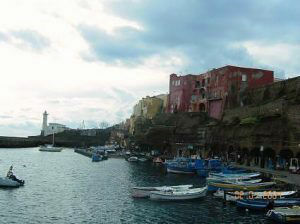 During the reign of Rome’s Caesar Augustus, Romans were encouraged to settle Ponza and Ventotene. In ancient times it is believed that Ponza was connected to the mainland by a narrow isthmus of land that eventually sunk into the sea. Modern marine archaeology is now confirming that fact. During the Middle Ages Ponza was abandoned due to constant pirate attacks until re-colonized by the Kingdom of Naples in the 1700’s. 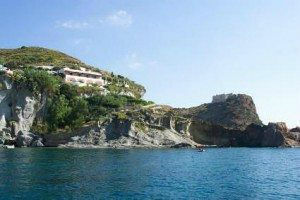 However is the the Roman civilization that has left the strongest historic mark on this island. There are many Roman ruins remaining on Ponza, including the ruins of the palace of Julia Lavilla, a sister to Caligula, who was exiled to Ponza. And a feat of Roman technology still exists; a 180 meter tunnel dug through the rock of the island from the fishing village of Ponza to Half Moon Bay, on the other side of the island, a spectacular beach ringed by white cliffs. Unfortunately, after centuries of use, recently workers damaged this tunnel which is now temporarily closed. I was lucky enough to be there before the damage and had the thrill of walking through this ancient Roman tunnel from the town side of the island to Half Moon Bay, and into a bright greeting of sun rays reflecting off of the water and white cliffs when emerging on the Half Moon Bay side of the tunnel. Many of the local inhabitants dig up Roman and Etruscan artifacts just while gardening. Further along the side of the island where Half Moon Bay is located, are a series of caves washed into the cliff sides including what was thought to be the “Grotto della Maga Circe”, the home of the sorceress Circe featured in Homer’s tale, “The Odyssey”. The Sirens were thought to have lived on the nearby islands of the Pontine Archipelago. This side of the island is best visited by yacht. Once anchored, take the ship’s tender along the cliff sides to explore the sea caves and grottos along this coast. Include the island of Ponza in your next crewed yacht charter itinerary along the western coast of Italy, and you will not be disappointed.